In considering a response to The Road Home, I am thinking how contrived, unnatural and, why not, futile, recent western cinematic productions seem. – Have you seen Bats? – And then, this meeting between Australian scriptwriters and funding bodies, which took place last year, comes to mind. Every story presented by the scriptwriters was convoluted with too many undercover agents and some predictable hairdressers as well. Which makes me wonder: having abandoned simplicity and plain story-telling are we being rather kind in our critical response to the “exotic” films from say China, Iran or Madagascar? 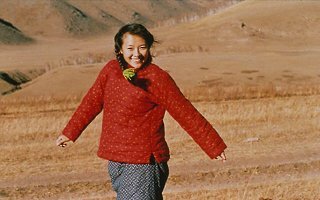 In The Road Home, Zhang Yimou returns to the plateau of his last film, the village school, collaborating with the cinematographer and the music composer from the said Not One Less (1999). With this text though, his dramatics are more affecting and effective. The centre of the story this time is the life and love of the village school teacher and his wife of forty years. Told in flashback by their son, who has returned to the village to arrange the burial of his father, the film is startling in its choice of opening style and scenes. In grainy black and white, we are looking at a jeep driving through snowy mountain roads; the son’s homecoming, or maybe an aftershave commercial. – Indeed, throughout the film, the present remains dark, whilst the past/flashback is told in rich and warm colour. – When the son meets the mourning mother, we learn of her desire to bring the coffin from the city back to the village on foot, carried by local men, as is the custom. As importantly though, we discover the story of the parents’ courtship, which is known to everybody in the village. I do not want to point to the smallness (read delicacy) of gestures, or the innocence of dramatic construction. Look at the two posters of the movie Titanic, strategically positioned in the old parents’ home, maybe as an attempt at sarcasm by Zhang. As for the cinematography, even when in full Cinemascope, I did think it felt somewhat agricultural. No, this is not a film of atmospherics. What we find in The Road Home is perfectly crafted story-telling of irresistible charm. Zhang sees this work a reaction to vulgarity and a return to a chinese – but not only – tradition: the poetic narrative. The magic for this commentator is distilled in the mother’s statement: “I cannot read but for forty years I would walk to the school and I would stand outside to hear his voice reading”. Cinematically it may be innocent but dramatically it is undeniably affecting. Although I did see the film in a media screening with seasoned viewers, I was not the only one with moist eyes at the end. See if you can resist! At a higher level, it offers a case for what environment may be fertile for great art. Again reading from Zhang’s manifesto: “Look, we think we have it hard here in China, but the pressures of Islamic Orthodoxy in Iran are far worse than anything we have to contend with here. But despite the pressures, Iranian directors succed in making great films.” There lies, I believe, the humility of a great creator. Dimitri Tsahuridis was born in Greece in 1964 and educated (mostly) there, predominantly in musical theory. In the Antipodes since the mid '80s, after writing some music for theatrical works he would never acknowledge in public, he has spent the last decade loitering in the word playgrounds.